This is our 6MM Pipe Cut Tungsten Ring. If you order this particular ring we will precision laser engrave a fingerprint of your choice on the outside of this ring. This ring is genuine Tungsten Carbide and is designed to last a lifetime. This ring makes an ideal promise ring, wedding band, and the addition of the fingerprint makes it a great gift for your significant other, or great from a child to a mother or father! The 6MM width of this ring is ideal for a womam, and good for a man looking for a narrower band! 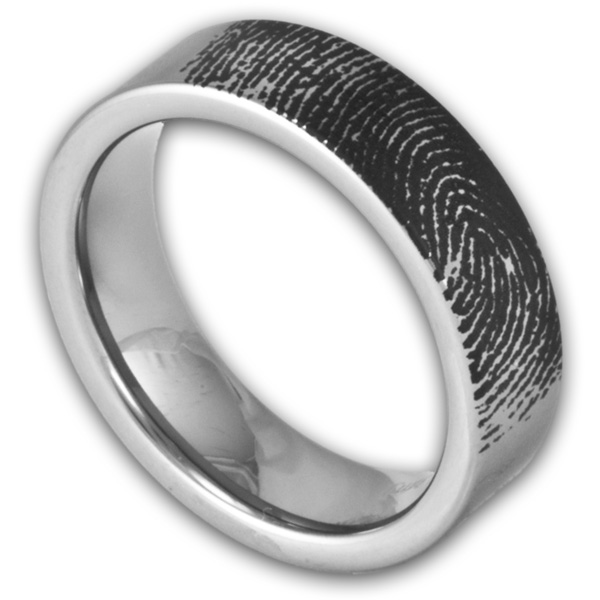 This ring has a man's fingerprint on it, to give you an idea of the size, we will crop the fingerprint to put the most interesting part of the print on your ring. Once you get good fingerprints to send in, you can use a scanner or a camera phone to take a high resolution photo of your prints and email them to service@ring-ninja.com. Be sure to send your order number so we can get the correct prints with the correct order. If you decide to select "Try ring(s) on first) we will send your rings with no engraving and you can make sure the ring fits, use the included return shipper to send us your ring back, and include your prints with the package and we will handle getting them into file form for the engraving. 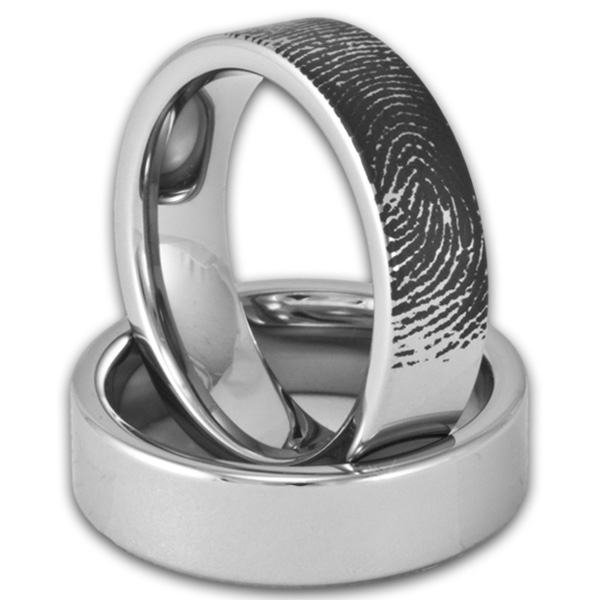 Once we receive your prints this ring takes about 2-3 business days to complete due to the complex engraving process. This ring includes Ring Ninja's Tungsten Ring lifetime warranty!